From time to time, a Sales Order which was drop shipped directly from a Vendor to a Customer will be returned. This article will show how this process will work when returning goods back into Inventory. In this first screenshot, we are able to see Order A15371T. This order only has 1 line, and it shows as a D (drop-ship) line on the order. This order has been Invoiced and is Completed. 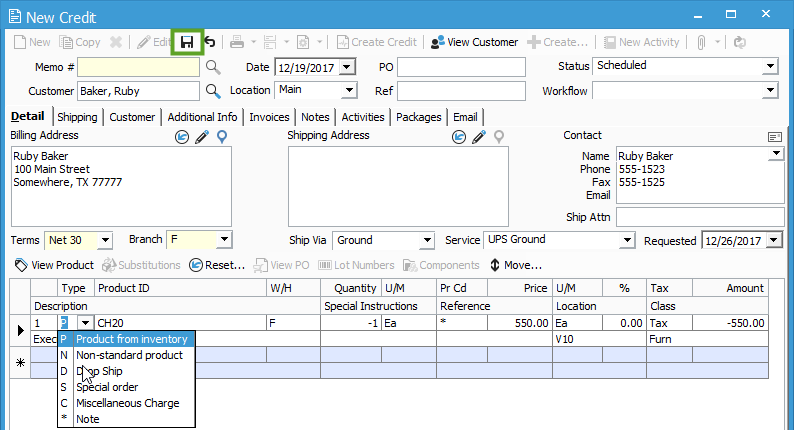 In this example, let’s say that the Customer (Ruby Baker) wants to return CH20 and you want to bring this back into your Inventory rather than shipping the product back to the Vendor. First, take a look at the Product(s) which the Customer wishes to return. In this next screenshot, we are able to see the Product window for CH20 (the only product on the Order). Notice that the Item Type is Inventoried. If this is any Item Type other than Inventoried, such as Drop Ship Only, it cannot be brought back into Inventory with a Credit Memo. Next, take note of the Cost Method of the Product as this will dictate the Value which is added back to the Product when the Credit Memo is posted. 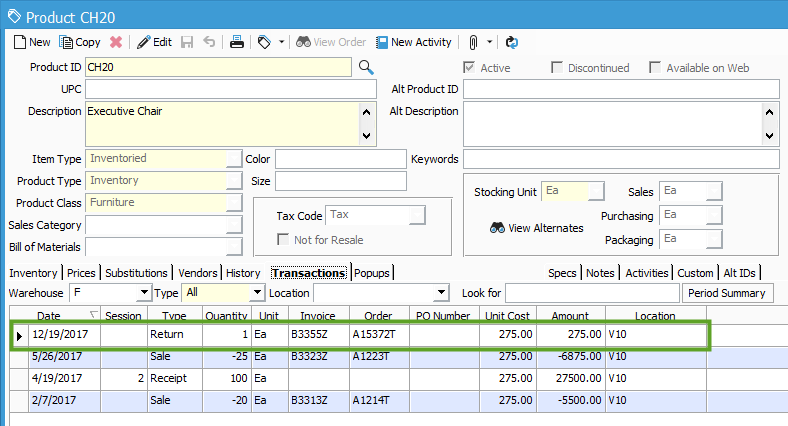 Assuming the Product(s) which are being returned are Inventoried products, click Create > Credit Memo from the Completed Sales Order (you could also click Sales > Credit Memo to create a new Credit Memo, then add the Customer). This will populate the New Credit window. Before saving the New Credit, make sure the Line Type is set to P, as this will tell Acctivate that the product will be brought back into Inventory, then click Save. Finish processing and post the Credit Memo. As the Line Type on the Credit Memo was set to P, CH20 was brought back into Inventory in the specified Warehouse. Since CH20 is an Average Cost product, the quantity on the Credit Memo is brought back at whatever the Average Cost was at the time the Credit Memo was posted. 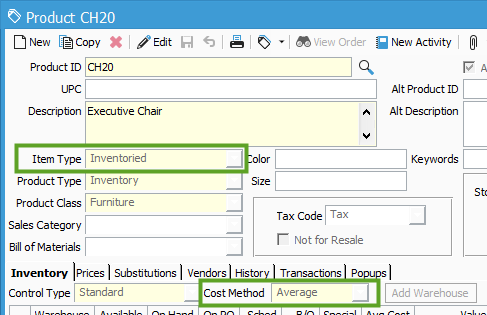 In our example, the Average Cost as of 12/19/2017 for CH20 in the F Warehouse was $275.00. So, the Credit Memo will add $275 to the Inventory Asset account related to the F Warehouse, and will offset to the COGS account. This process works the same way a Sales Invoice would work, only backwards. If you have any issues with the Credit Memo, or if something happens that you do not expect, you can contact Support here.